Classical music can swing creative doors wide open for guitarists old and new. Learning classical techniques teaches discipline and improves speed and dexterity. The Cádiz Series CC7HCE with its outstanding tone and construction inspired by the luthiers of Andalusia is the perfect instrument to explore this exciting genre of music. With a slimmer neck profile, this instrument is perfect for players transitioning into the world of classical and flamenco music, allowing for less fatigue and a more familiar playing experience. In developing our new Classical and Flamenco guitars, we started our journey in Cádiz, the beautiful most southern province in Andalusia and the home of the Classical guitar. Our aim was to learn more about the history, the music and construction of these amazing instruments before embarking on R&D. The result of this intense study is the Cádiz Series, which we believe will engage any player, whether a seasoned professional or someone looking for different tones from an engaging nylon string guitar. Classical music can swing creative doors wide open for guitarists old and new. Learning classical techniques teaches discipline and improves speed and dexterity. The Cádiz Series CC7 with its outstanding tone and construction inspired by the luthiers of Andalusia is the perfect instrument to explore this exciting genre of music. The twelve string guitar has become an essential tool within any guitarist’s overall arsenal of instruments. Not only can it produce a chiming wall of sound that no other instrument can achieve, but it can also open new doors of inspiration for songwriters and performers as they explore its unique tones and voicings. Our remarkable AJ80CE-12 is designed to harness all the power and projection of a jumbo cutaway and deliver a twelve string with superb balance and string tension. A beautiful package with a Solid Sitka top, and Maple back and sides construction, the AJ80CE-12 comes complete with an LR Baggs EQ and pickup system. Flamenco music can swing creative doors wide open for guitarists old and new. Learning flamenco rhythm and fingerpicking techniques improve speed and dexterity and trains the ear in modes and chords not commonly found in modern music. The Cádiz Series CF6 with its narrow profile body and tone inspired directly from the region where Flamenco music was born is the perfect instrument to explore this exciting genre of music. The lower register of a Baritone guitar can inspire like nothing else. Have you ever written a chord progression or solo, and wished you had a way to play it in a lower register to fit with your accompaniment better or just to explore another tone? The Alvarez Baritone is our award winning guitar that opens up the bass spectrum and allows that exploration and inspiration to flourish, delivered at one of the most affordable price points on the market. 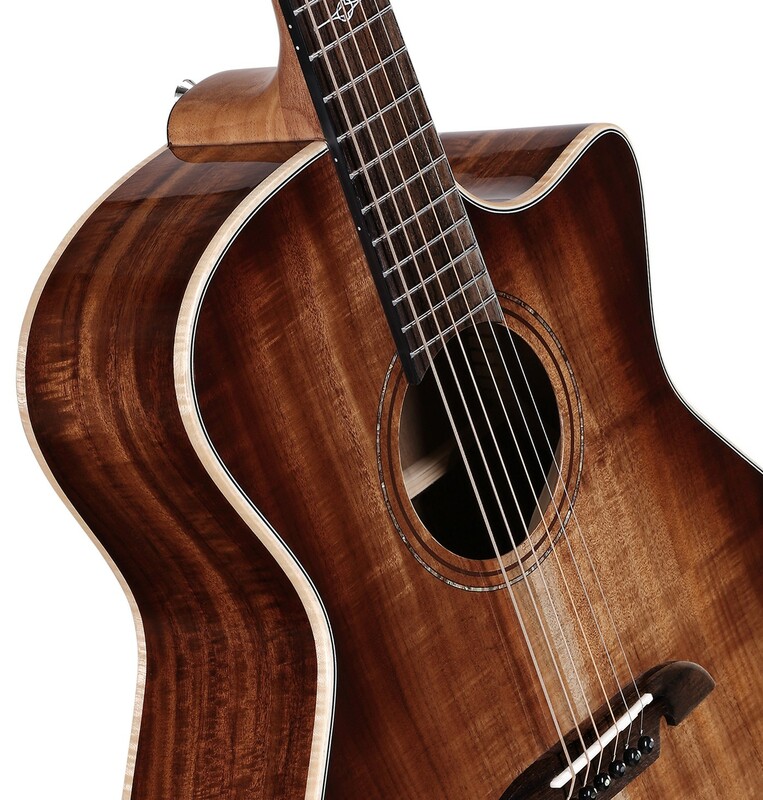 The ABT60E is equipped with a fantastic LR Baggs EQ and Pickup System, perfect for live performance. For steel string players looking for an easy transition to classical, or for classical players looking for an entirely new player experience, the AC65HCE is the perfect choice. Featuring a narrower nut width than a standard classical, and a radius fingerboard and neck that joins at the 14th fret, the AC65HCE allows for more agility when fretting and faster picking with its tighter string spacing. 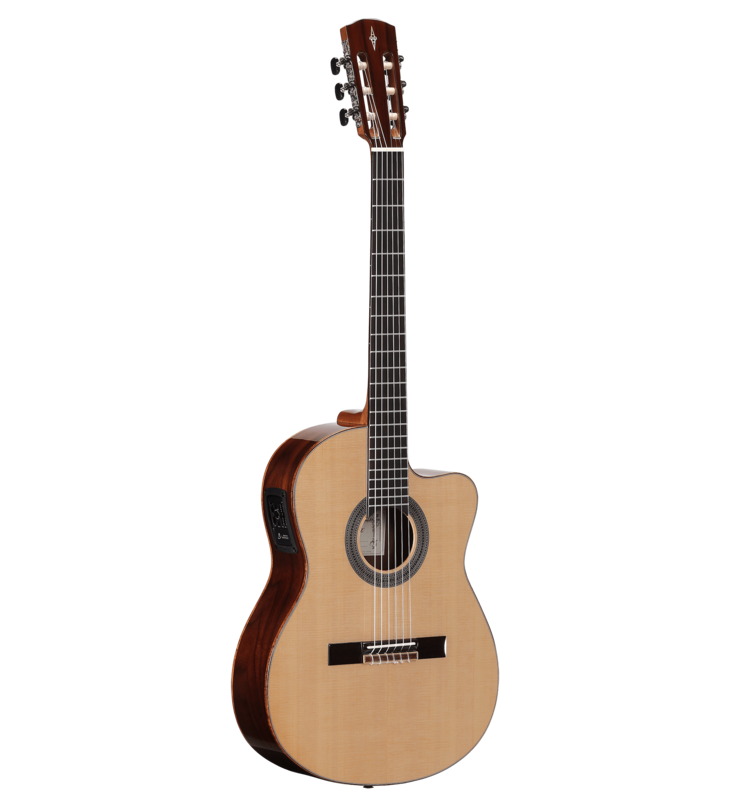 Alvarez Guitars use traditional style construction for its entire classical guitar line incorporating a Spanish heel neck joint and tapered fan bracing to deliver stability, balance and volume across all six strings. The Artist 65’s are very responsive guitars with a warm and open tone. The AC65HCE acoustic electric hybrid is fitted with the fantastic LR Baggs StagePro EQ and Element pick up for optimal live performance. In 2016 Alvarez launched their genre-specific Jazz & Blues Series; a line of guitars that focused on the vintage sounds and tones of blues & roots music and jazz. Two years later this line has been incredibly well received and won awards all over the world. The Blues51W/TSB embodies the acoustic side of the iconic vintage sounds of the early 20 th century. With a slim character, arched back and a specially designed back shifted scalloped X brace, there really is no better instrument to recreate the music of a bygone era, which is very much alive and in vogue today. Players who fell in love with the sound of Robert Johnson and other artists from the dust bowl will love the way the Blues51 responds to fingerpicking and strumming. An acoustic electric version is available in the Blues51WE/TSB for musicians looking to perform in a live setting. The Delta00/TSB embodies the acoustic side of the iconic vintage sounds of the early 20 th century. With a slim character and a specially designed back shifted scalloped X brace, there really is no better instrument to recreate the music of a bygone era, which is very much alive and in vogue today. Players who fell in love with the sound of Robert Johnson and other artists from the dust bowl will love the way the Delta00 responds to fingerpicking and strumming. An acoustic electric version is available in the Delta00E/TSB for musicians looking to perform in a live setting. June Creative Tools | LJ2 "Little Jumbo"
Demand of small body acoustic guitars never seems to slow. They’re great for travel, hitting the beach or lazing around the house. With a few tricks and careful design you can make small body guitars sound fantastic and much louder and balanced than one may think, which is exactly what we’ve done with the LJ2. Carefully designed with a unique bracing pattern and arched back to give you an incredible tone and response from a small bodied guitar. The LJ2 is a serious little instrument, perfect for when you’re on the road, at the beach or sitting around the house. Comes with a 15mm DuoFoam Deluxe gig bag, ready for a journey. Musicians and students today need instruments as mobile as their lifestyles. Small footprint guitars like the Delta DeLite make it easier for traveling musicians to practice, write and perform on the go, and they also live in a special place sonically. The Alvarez Delta DeLite from our Jazz & Blues line of guitars is a fantastic blend of compact size and inspiring vintage tone, designed to get the best out of its smaller body shape with a graduated solid sitka top and custom bracing. With its diminutive body shape you’ll be able to play and explore a new possibility of chord stretches and lend a vintage voice to your compositions and covers. The Delta DeLite comes with a deluxe 15mm gig bag, can go with you anywhere, and we’ve made sure to present it at a very affordable price.